Guinness is known for their traditional stout. That is one of the best and well known beers out there. Yet the people at Guinness are not going to stop with just making one thing. They have been branching out and making a few other beer varieties. 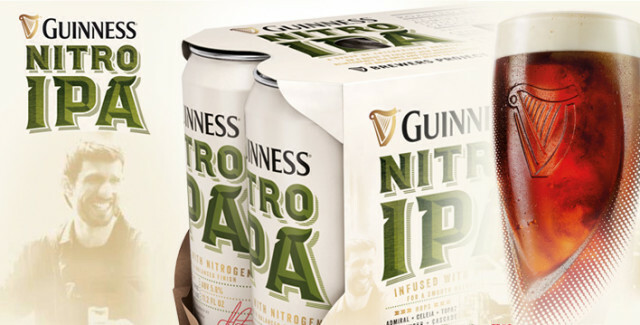 One that is coming to the market is the Guinness Nitro IPA. Made in Dublin, Ireland at St. James’s Gate, Guinness Nitro IPA is brewed with Irish barley malt, a touch of roasted barley and five hop varieties — Admiral, Celeia, Topaz, Challenger and Cascade. The Challenger, Cascade and Topaz hops are dry-hopped to accentuate a sharp citrus aroma. The beer’s blend of CO2 and Nitrogen helps to balance out the profusion of hop flavors, while also creating the signature surge and settle made famous by Guinness Draught. The IPA is brewed with the same unique Guinness yeast strain used to ferment all stouts at St. James’s Gate. Print article This entry was posted by Art Eddy III on September 21, 2015 at 7:38 am, and is filed under Photos. Follow any responses to this post through RSS 2.0. Both comments and pings are currently closed.